The Ohaus Adventurer Top Loading Balance brings you precision weighing with a broad range of modes, excellent stability and almost no upkeep. 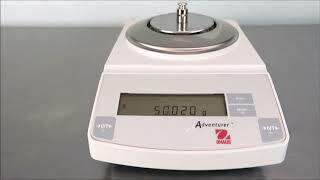 This digital balance has a capacity 150g, and can weigh in kilograms, milligrams, carats, Newtons, pounds, ounces, troy ounces, grains, pennyweight, mommes, mesghals, Hong Kong Taels, Singapore Taels, Taiwan Taels, Ticals, and Parts Counting. The Adventurer balance body is built with durable construction for long life, and includes features like a leveling bubble, a weight hook for weigh below functions, and a large format LCD for easy programing. The closed membrane control panel of this lab balance with clearly marked functions make choosing options easy, and clean up a snap. This digital scale comes with a standard RS232 interface letting users set up communication with a PC for data collection or with a printer for records. This Ohaus Adventurer Balance has been thoroughly inspected and calibrated with our in house weights. All of our lab equipment comes backed with our standard warranty. Should you have any questions, please don't hesitate to contact us.